You are here: Home / 2019 / Bayram Namaz illuminates our path! Marxist Leninist Communist Party (MLKP) representative for Rojava, Bayram Namaz (Baran Serhat) lost his life as result of an attack by the Turkish occupation forces and allied mercenaries in the morning of March 23. MLKP/Kurdistan released a statement stressing that neither mass massacres like the Suruç, nor vile attacks on their leading cadres, like Baran Serhat, can stop their march of revolution, prevent their struggle for freedom and socialism or strangle their free Kurdistan dream. 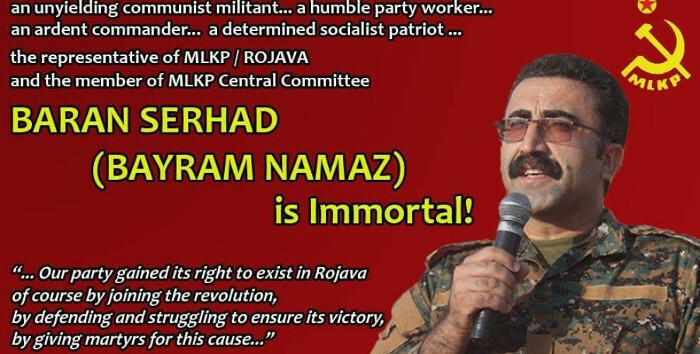 "Comrade Bayram Namaz (Baran Serhat) marched to immortality on the morning of March 23 in Serekaniye, Rojava after a vile attack of the Turkish state and its collaborator gangs. While he was on his revolutionary duties early in the morning as usual, as a result of the explosion of a bomb that was placed in his car, he was martyred and the comrade next to him got wounded. Comrade Baran Serhat was a member of our party's Central Committee and the Kurdistan Committee, as well as the representative and commander of our party 's Rojava organization. It is no coincidence that comrade Baran Serhat, who has been one of the leader cadres of MLKP, became a target. This attack is the continuation of the Suruç massacre, which aimed to blow down the united revolution bridge of Turkey and Kurdistan. Our party has positioned at the forefront of war trenches, right after the Rojava Revolution began. On almost every front from Kobane to Raqqa, Minbij to Efrin, our party fought against the collaborative gangs of the Turk ish state and gave martyrs. Our party played an important role in frustrating the conquest plans of the colonialist fascist Turkish state in Rojava and Northern Syria by the hand of its collaborative gangs. During his five years in Rojava, Comrade Baran served as the ideological, political, organizational and military leader of our party forces. He took a primary part in the multidimensional education of dozens of comrades. For the triumph of the Rojava Revolution, he worked with his mind, his labor, his love, and his revolutionary anthusiasm. He ran from front to front. He conducted the establishment process of the International Freedom Battalion. With his revolutionary audacity, his consciousness and self-expression, Comrade Baran represented the leadership strength of our party, which defines itself as the sacritice division of the revolution. He lived 24 hours for the revolution. Without questioning whether small or big, he associated with every revolutionary task with revolutionary devotion and care. Comrade Baran participated in the establishment and development of Peoples' United Revolution Movement (HBDH). He has striven for practicing the decisions of HBDH, for the unity of word and action. He followed the unified revolution line with a perspective of llie Middle East regional revolution. Comrade Baran was a Kurdish communist from Serhat region of North Kurdistan. From 2003 until his arrest in 2006, he was a member of the Kurdistan Committee of our party. He undertook the leadership of the Northern Kurdistan work . He became prominent with his resistance in dungeons against torture. He turned cells into a school of revolution. He was a member of the Kurdistan Commmittee since the day he finished his revolutionary mission in dungeons until the day he immortalized. He made a great concribution to the construction of the line of socialist pacriotism of our party. He put himself forth utmost for the practicality of this line. He combined the actual legitimate struggle with the illegal struggle. He blended his organizing and working manner with political military struggle. Wherever he was, he upheld the slogan of "free Kurdistan" and embodies it in his own personality. Colonialist fascist gangs must know, neither mass massacres like the Suruç, nor their vile attacks on our leading cadres, like Baran Serhat, can stop our march of revolution, prevent our struggle for freedom and socialism or strangle our free Kurdistan dream. The ignominious enemy hordes must know, our party's Baran Serhats are inexhaustible. The men and women commanders and fighters, who Baran Serhat cultivated with his labor, are ready to fill his watch. No matter what you do, we will grow and come like an avalanche. We have placed the dreams of our immortals into our gun barrels. We are going to be Baran (rain) on you wilh our bullets and bombs. You can not stop us. We will continue to defend and build the Rojava Revolution. We will destroy your colonialist fascist regime. We will free Kurdistan. Young women and men, to the fore, to the ranks of the party, to being Baran! We are the party of Baran Serhats, you cannot stop us! MLKP is invincible! Baran Serhat is immportal! Long live Freedom and Socialism!"